The third chakra is the seat of personal power, the sense of self, and will. When it is activated and in balance, you feel confident, able to express yourself, and able to conduct your affairs in the world without hindrance. When the manipura chakra is dim, you will feel timid, weak or meek. Unable to fulfill your aspirations. Unclear about your path. Unable to manifest. On the other hand, if it is in excess, you can become domineering, boastful, and controlling. 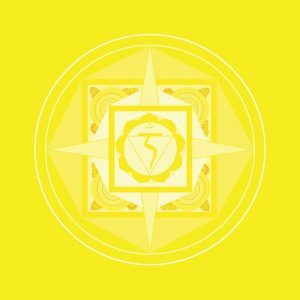 When this chakra is glowing brightly in a nicely balanced way, you’re practically unstoppable — capable of making your dreams come true without sacrificing healthy interpersonal relationships. You feel confident and capable. You feel a healthy will to carry out your work or personal mission. You are able to fulfill your dharma. You have purpose, self-respect and strong communication skills. Too much fire in the navel center can lead to arrogance, greed and too much ambition. Your drive to succeed, accumulate and accomplish could become insatiable. Not enough fire and you will lack self confidence and self-esteem. When in lack, you will come across as wishy-washy and co-dependent. Interpersonal communication suffers from either a lack of boundaries or too much rigidity. Yoga asana can stimulate the chakras. The manipura chakra is associated with the mid-body, especially the navel and solar plexus. Envision a slouchy stance belonging to someone lacking in the fire of manipura; someone with an overly erect or bombastic posture containing too much fire; and someone with a comfortable, well-aligned posture being nicely in the middle with a well-balanced, freely moving manipura chakra that offers a beautiful glow. Because it’s linked to the element of fire and to the process of digestion, it can best be awakened through strengthening poses, front-body openers and twists. Baby appreciates more room in the third chakra. Bring focus to the solar plexus and upper navel. Breathe space into this region. Lift the pelvic floor so powerfully you can feel an upward shift through the navel and beyond. Draw awareness to even the back body. Instead of compressing there, think of bringing length and space behind the solar plexus. In addition to shining, opening and lifting the navel center, you’ll want to strengthen and stabilize it. From downward facing dog, bring your knee to your nose — and really aim to touch! Instead of hurrying on to the next shape, stay for five full breaths drawing your knee and nose closer and closer together. This way, you refine your power, bringing a touch of grace into your strength. A lot is happening at the hip flexors here, which may be the most obvious sensation. Try drawing attention into the whole length of the abdominal region, from the base of the sternum to the top of the pelvis and deep within the abdominal wall. Twists are the go-to poses to stimulate manipura. That’s because wringing out the internal organs can stoke the internal fires of digestion. Ardha Matsyendrasana is a classic twist, but it can be executed in such a way as to bring attention to the third chakra. Note where your spine rotates freely — lower back? mid-back? neck? Use the whole length of the spine to revolve, but bring particular attention to the soft area just beneath your rib cage, the solar plexus. Think of it existing in a 360-degree plane, so that even the side body and back body participate actively in the revolution. Take a long, slow slip of breath and notice where you tend to place the oxygen. Is it in the chest? in the belly? Instead, try fanning out the bottom-most ribs bringing 360-degree space and freedom to the manipura region. If you’re going to err in one way or the other, which way do you tend to go: to slouchy posture and a downward gaze? or to a chest-lifted posture and an upward gaze? Take note of your posture throughout the day — when you’re standing, when you’re sitting, even when you’re driving — and try to place yourself in a neutrally aligned, upright position. Reflect on how your posture impacts your mood and vice versa. Can a simple shift in stance lift your spirits? Ask yourself: In what ways is my sense of self strong? In what ways have I compromised or allowed myself to be influenced by others? Inquire: What is my purpose in the world? (It’s okay to not know.) If you have some sense of purpose or direction, which activities and habits pull you off course? What action(s) would it take to best be of service in the world? Is there a situation in which a little more “fire” would have done you good? On the flip side, can you think of a time when tempering your inner fire would have been wiser than letting it roar? May your inner fire be stoked, warm and bright.